the life you’ve always wanted! I’m Memnia, a motivational speaker, dentist, adventurer and the creator of the Courage to Lead newsletter that empowers people to awaken their confidence, step out of their comfort zone and lead the life they’ve always wanted! A Free guide made to help you create a life of abundance and meaning! Get your guide when you join my Courage to Lead monthly newsletter, designed to inspire you to lead the live you’ve always wanted! My passion for inspiring others to take action on their dreams, has seen me being invited on stages and workshops, sharing my unique life story and motivating others to take a step outside their comfort zone. My unwavering belief that we can achieve a lot more that we give ourselves credit for is contagious and my audience always feels empowered. Keynote Speaker at EBRD - London for International Women’s Day. Within the framework of promoting gender equality, Memnia was invited to be the Keynote Speaker at the headquarters of EBRD (European Bank of Reconstruction and Development), in London, in celebration of International Women’s Day 2019. 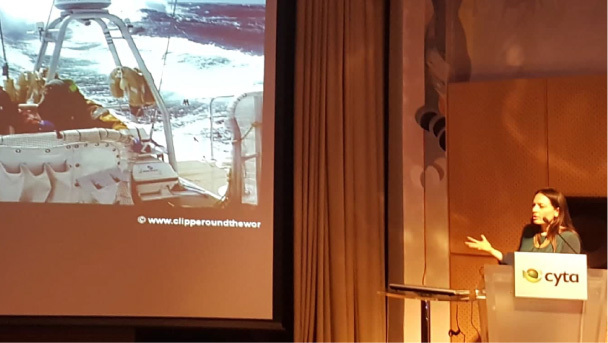 EBRD-Connect, the internal networking steering group, heard Memnia giving a passionate talk about resilience, courage and perseverance through adventure. Speaker at CYTA-Vodafone’s “Shots of Inspiration”. Within the framework of promoting innovation and entrepreneurship, Cyta’s Innovation and Idea Development Centre organises “Shots of Inspiration”. Held monthly, these forty-five minute presentations, spotlight successful individuals or companies that focus on creativity and innovation, in order to inspire participants, to break the barriers, create a different way of thinking, and ultimately construct a more dynamic, and enthusiastic approach to problem solving, life skills and the workplace. Speaker at Women Fit For Business organised by AIPFE - Women of Europe and hosted by EY-Cyprus. A 9-month programme born through a collaboration of EY Cyprus and AIPFE Cyprus-Women of Europe, geared towards unemployed female university graduates under the age of 35. A collaboration that aimed to empower, motivate and connect participants through practical training and soft skills to assist them in their search for work. Workshop Trainer at University of Nicosia, Cyprus. A workshop aimed to inspire and motivate young minds that are currently studying subjects related to “Small to medium enterprises, Business, Innovation.” There was an opportunity for the students to discuss traits they need to work on to be successful in their chosen fields, like resilience, courage, perseverance and bravery.